A Muslim husband and wife in Britain have been convicted of plotting to murder Jews in Manchester. A Muslim couple from the Manchester region of Britain has been convicted for plotting to murder Jews. The two will be sentenced Friday. Mohammed Sajid Khan, 33, confessed to engaging in conduct in preparation for acts of terrorism. Shasta Khan, 38, denied involvement in the plan, but a jury found her guilty of preparation for acts of terrorism and possessing information useful for committing or preparing for an act of terrorism. The two had read Al-Qaeda propaganda and were learning to prepare bombs. Data taken from Shasta Khan's satellite navigation device showed that the two had made multiple trips to Jewish neighborhoods in Manchester in order to look for targets. Police found materials for bomb-making in their home. The plot was uncovered when police responded to a domestic dispute. While they were there, one of Shasta Khan's brothers told officers that he believed Mohammed Khan to be a "home-grown terrorist." Officers searched the home and found videos of terrorists beheading their victims and other propaganda along with chemicals and electric equipment for bomb-making. The equipment the couple chose to gather, which included bleach and Christmas lights, was suggested in the Al-Qaeda magazine Inspire. The magazine said its recipe for a bomb would create explosives that could kill "at least 10 people." On Thursday, Britain charged four people with plotting terrorism in London. 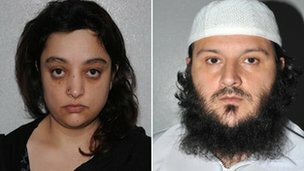 A husband and wife who planned a terror attack on a Jewish community in north-west England in an attempt to carry out "jihad at home" have been sentenced. Mohammed Sajid Khan, of Oldham, who had admitted terrorism charges, was given an indeterminate sentence, with a minimum of seven-and-a-half years. His wife Shasta, who was convicted at Manchester Crown Court on Thursday of terror charges, was jailed for eight. A cache of terror-related material was found at the couple's home last July. It included beheading videos, propaganda glorifying Osama bin Laden and bomb-making guides. Passing sentence, Mr Justice Wilkie told Khan he was "a significant risk" to the public and had been a "committed Islamic extremist". He added: "Your preparations were serious and well advanced over a broad front so that, if undisturbed, I am satisfied that before too long you would have been in a position to launch a potentially deadly attack." Khan, an unemployed car valeter, had a history of previous convictions and has previously spent time in jail for violent offences, the hearing was told. The judge added: "Unhappily, by virtue of your previous criminal record, you are plainly a man who has proved capable of using violence." Khan pleaded guilty to engaging in conduct in preparation for acts of terrorism. The judge then told his wife she was rightly convicted by the jury as she played "an active part in the plot" and was "aware the house was awash with extremist Islamic propaganda". "You had become, under the influence of your husband, a devoted Jihadist motivated by extremist Islamist beliefs," he said. His wife, who denied terrorism charges, was found guilty of engaging in preparation for terrorism and two counts of possessing information useful for terrorism. She was cleared of a charge of possessing information useful for committing or preparing for an act of terrorism. Det Ch Supt Anthony Mole said: "Mohammed Sajid Khan and his wife Shasta devised a plot to acquire the ingredients, equipment and the know-how to build a viable explosive device. 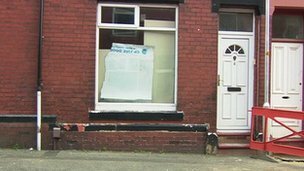 "Armed with that knowledge, what we recovered from their home suggested they were in the preparatory stages of assembling that device and, disturbingly, were driving around Jewish communities in the Manchester area looking at possible targets."